Four our fifth Beers Made By Walking hike we headed into Manitou Springs, and climbed up to the Midland Railroad Grade. This one was led by botanist Liz Klein and the homebrewer that came along was Rich Mock, who I met way back at the Vail Big Beer Festival in January. 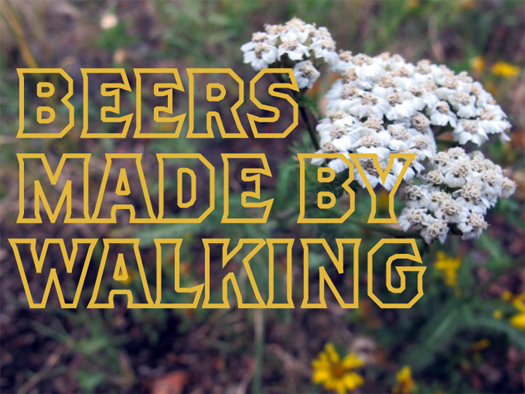 Rich is going to make a beer based off of edible plants we found on this hike, which begins with a nice but short trek through some lush vegetation and heads into a really steep, gravelly climb. Eventually it dumps you off at a trail on the top and it turns out to be quite unique with a number of tunnels and noise from the nearby highway. The climb and the view from the top. Rich taking notes while Liz tells us about the Yucca. At the top, almost immediately you enter a series of tunnels. The first one is a bit long and gets pretty dark. A few people have camped up there so, unfortunately, there's quite a bit of junk. The tunnel proves to be quite a bit cooler than outside and was a lot of fun to walk through. A view from inside the tunnel. Lots of dust floating around in there. Some of us brought flashlights. Here Liz is telling us about gamble oak. None of the brewers so far have used acorns in their beer, but I think it would prove to be interesting. We identified a number of plants thus far on the hike, including various wild sages, wormwood, yarrow, chokecherry, catnip, mullein, and more. And whoa! What is this? Wild hops growing all over the hillside! Seriously, there were so many hops growing in this area, it would be a homebrewer's dream come true. This was the first (and turns out to be only) hike where we saw wild hops. There's really no way to tell what kind of hops these are, although I'm sure there is a specific variety that grows here in Colorado, but we have no way of testing the alpha acids, we don't know what amount of bitterness it will impart to the beer, and we don't know what kind of flavor these hops will be...sounds good to me! Emerging from one of the five tunnels. Some yarrow on the trail. In the end, Rich was thinking about making a type of Gruit, which is a traditional beer that doesn't have hops. Usually yarrow, mugwort, or some type of bittering plant is used to balance out the sweetness of the malted grain. However, after finding wild hops along the way, Rich decided that there was no way he couldn't not use them. He's going to use yarrow and a type of artemesia (wild sage) for bittering and he's going to use some hops for flavor and aroma, so even though it's not a true gruit because there are hops, the hops aren't actually being used as a bittering agent. Rich's recipe was brewed up at Pikes Peak Brewing and will be available for tasting at Brewer's Republic only on October 29th from 4-8pm, along with the three other beers. They'll be served on homemade sample trays. $5 gets you in the door, and you can taste as much as you want. Here's pictures of the first tasting event.